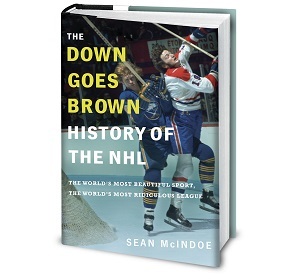 Down Goes Brown: Is Daniel Alfredsson a Hall-of-Famer? It’s not looking good for Daniel Alfredsson. The 41-year-old free agent has yet to rejoin the Red Wings, and it’s becoming increasingly clear that the back problems that bothered him throughout the summer are still an issue. While the Red Wings are willing to give the veteran as much time as he needs to make a decision, a return is becoming less likely with every week that goes by. With Hall of Fame induction ceremonies taking place this weekend in Toronto, attention will naturally turn to potential future classes. And that makes Alfredsson’s status all the more interesting, because if his career ended today, he’d become one of those tough calls that make Hall of Fame debates so much fun. So let’s do this: If Alfredsson has indeed played his last NHL game, is he a Hall of Famer? Here’s the case for and against. For forwards in the modern era, topping the 1,000-point mark has long been considered the minimum threshold to get into the Hall of Fame discussion, and Alfredsson clears that mark comfortably with a career total of 1,157. He falls short of the 500-goal mark, another milestone that bolsters a case, but he was never viewed as a pure goal scorer, and his 444 goals are within the lower range of what the Hall seems to consider acceptable. Alfredsson’s career totals are decent, but they fall well short of sure-thing territory. He sits 51st in career points, behind guys like Bernie Nicholls and Vincent Damphousse who never even dipped a toe into serious HOF conversation. That’s not an especially great comparison, since those guys played in a higher-scoring era. But nobody ever said these debates were fair, and some selection committee members might look at Alfredsson’s totals and feel underwhelmed when the comparisons start getting thrown around. He also only topped 40 goals and 90 points once in his career. Basically, his numbers fall into that “consistently very good, rarely great” category that sometimes fails to impress voters. One Hall of Famer who overlaps much of Alfredsson’s era and had similar career point totals is Joe Nieuwendyk (1,126), who made it in his second year of eligibility. Sergei Fedorov (1,179) is expected to get in once he becomes eligible in 2015, and Jarome Iginla (1,176) would make it if he retired today. Guys like Glenn Anderson and Joe Mullen are also in, despite playing in the high-scoring ’80s and putting up fewer career points than Alfredsson. Of course, the most unavoidable comparable for Alfredsson is Mats Sundin. Those two have always been linked thanks to the Leafs/Senators rivalry, and because they were off-ice friends as well as teammates on various Swedish international teams. Sundin finished with significantly better career totals, including 564 goals and 1,349 points, but he had the benefit of playing a few years in the early ’90s. Sundin made it in in his first year of eligibility and nobody really batted an eye, so that would imply that Alfredsson should at least have a shot. According to hockey-reference.com’s career similarity scores, Alfredsson’s two most comparable players are Jeremy Roenick and Keith Tkachuk. Both of those players have been eligible for a few years and settled into that perpetual “close, but not this year” territory, although Roenick, at least, has an outside shot to get in eventually. Other guys with similar career numbers include Pierre Turgeon, Alexander Mogilny, Rod Brind’Amour, and Theo Fleury, not to mention a guy like Dave Andreychuk who’s well ahead of all of them. That’s a group of really good players, but none of them ever gained much Hall of Fame momentum.